It’s safe to say that I’m drawn to bright colors. Way back, when I was taking a class with a Famous Quilter, who is also Very Nice, said that my color choices were “cheerful”. Having seen the types of fabrics I gravitate to when I do add to my stash, that is still an accurate statement. It’s no wonder, then, that I really love Christa Watson‘s fabric lines; her most recent one, Abstract Garden, debuted at Quilt Market last fall (when our show did, too! ), and we got to pitch in at her schoolhouse session and generally hobnob with her. Christa is really good about creating a focal print with lots of other basics that coordinate across all her lines with Benartex. 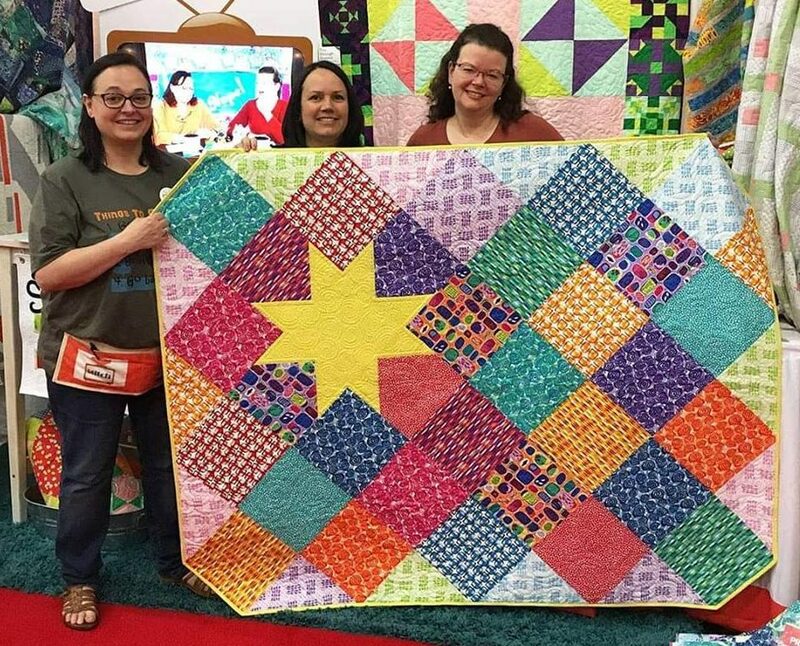 And she doesn’t forget the value of value, which makes it easy to make a quilt entirely from her fabric line and still get contrast like in our 10″ square precut pattern A Star is Born, which also debuted at Market in her fabric line. We were excited to be offered a chance at the Bernatex Sew in Love with Fabric blog hop for her line, and are happy to offer a giveaway for a FQ bundle of 8-10 of the fabrics, too! The giveaway is limited to the United States only, so we appreciate your understanding on that. Enter the giveaway on our site below by Saturday evening, Feb 16, and visit the other bloggers in the blog hop for more chances to win! This is my first visit to your blog so I don’t know what you have shared. I biggest obstacle is deciding how to quilt a quilt and keeping it consistent. Any help there? Love your quilt and it is cheerful! Thanks for making such a fun pattern with my fabrics!! I love the Star is Born quilt. Great idea for a layer cake I have. Pam, always love seeing your cheerful quilts! And Christa’s fabrics are so beautiful!! A great, simple quilt to showcase these beautiful fabrics! I would like more information about when you TVShow is in my area. Hi Rosemary, our show is one YouTube so it’s available where’re there is internet! Just visit YouTube.com/thestitchtvshow . I would like to see something on free style / improv piecing. I learned from watching you about having a focal point in my quilt and what a difference it can make, love Christa’s fabric, true colors! New tools or rulers is always fun. Great quilt, love the colors. 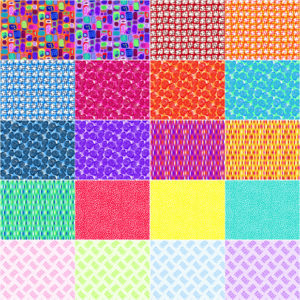 I am new to your show –I like lots of ideas for scraps and precuts. I love to learn about new sewing and quilting tools and how they are used. I would like to see more ruler work demonstrations!! Thank you. THe phrase “quilt as desired” always makes me nervous….more ideas on figuring out the best quilting designs for your top!!! Any quick ideas for precuts would be great! I love your A Star is Born pattern! I just now discovered you, but anything about quilting is worth talking about. Would love to learn about new quilting accessories & tools! I am always looking for fast and easy things to make for gifts…would love to hear more of your ideas!! I love quilt history. Maybe highlight a museum. Have you done an episode showing different versions of your Star Is Born quilt? I love the pattern and would be interested in seeing how it looks in different fabrics. I’d like to learn more complicated appliqué. Love your quilt. This is my first visit so not sure what has been shared but I like to see new quilting tools and techniques! Great quilt highlighting beautiful fabrics. Your “Star is Born” would definitely be a good candidate for a Project Linus quilt. So bright and colorful. I haven’t watched any episodes yet, so I don’t know what you have already covered–surprise us! I love making bags, so any show about bag-making would be welcome! on the outside of the fabric. I would like to see you do a segment on designing quilts. I would like to see different quilt blocks. I would make a crumb quilt with these fabrics. Love the bright colors! I’d like fun quilt ideas for Jelly Roll quilts. I’d like to see EPP, the more complex the better. I’m glad I found this blog!! I plan to watch many episodes. I love watching quilt patterns, also tips and shortcuts. Love this quilt! It perfectly shows off the prints with the large pieces! Love this pattern and fabric line. The fabric colors and patterns are so pretty. I really enjoy your “shop from stash” segments and seeing how differently you approach the process. I enjoy most topics that relate to sewing! Currently, I’m interested in how to choose fabrics to coordinate for a quilt. I struggle so much with this! Choosing fabrics for a quilt, achieving value balance, exploring mixing prints an colors Australian quilter style (think Kathy Doughty). I would love to make a lap sized quilt. Thank you for all of the inspiration.